Directly opposite the foreshore, a quiet street is all that separates you from the sunrise and walks on beautiful tropical Four Mile Beach. 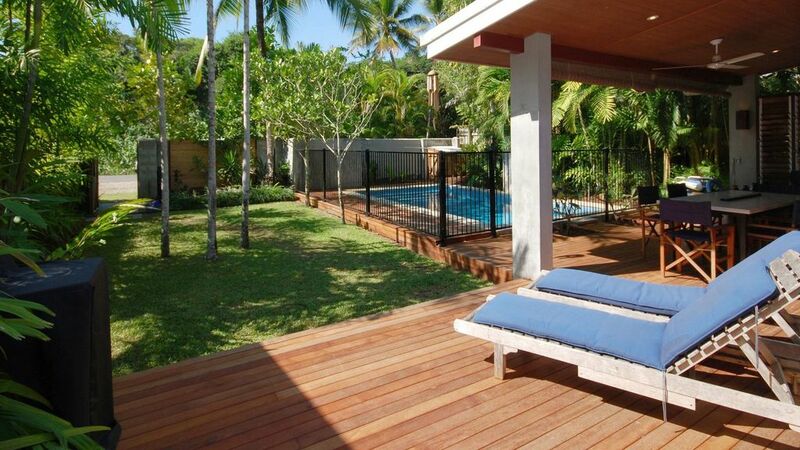 Sand Street is only a short walk away from Macrossan Street, the hub of Port Douglas. The large open plan living area features a built-in 7 metre lounge and lots of space. The cool grey tones of rustic polished concrete compliment the rich timber trimmings and combine with textural elements and printed textiles to create a soothing interior, perfect for relaxation and easy living. The kitchen makes food preparation a pleasure. Equipped with modern appliances and cupboards filled with crockery, glassware, cutlery and cookware. The kitchen has plenty of bench space and has the convenience of a servery to the outdoor dining area. The King-size master bedroom with its simple understated elegance opens onto a delightful bathroom. This en suite bathroom has double showers, sinks and separate toilet. A Queen size bedroom looks out to a courtyard with lipstick palms and flowering plants. Both bedrooms have ample storage and delightfully simple decor. The third bedroom has two single 'end to end' beds on a raised platform. Glass doors open onto a pebbled courtyard filled with exotic foliage. The second bathroom has a separate toilet, laundry facilities and a shower. Double glass windows open onto a concealed courtyard with dense tropical palms for absolute privacy. The villa features air-conditioning in the bedrooms and has a TV, DVD, CD in the lounge room. The villa has a Wifi internet connection. Excellent for families with small children, the villa has a fenced heated swimming pool and a sunny, grassy yard. Come and stay in Port Douglas, one of the most sought after holiday destinations in the world with the most beautiful natural attractions. This location is the closest mainland departure to the country's famous Great Barrier Reef!